There is a story in today's New York Times about a charter school in Florida and Jeb Bush. Only one little problem. This school was a complete failure. It is closed and in ruin. It shut down seven years ago. Yet, just last month, Bush is telling audiences about how successful it was and is. What is going on and why do I bring this up here? This is a relevant example of deliberate self-blindness and being seduced by the myth, the story, the illusion. The story / myth is wonderful, successful.... but the reality, well, its the complete opposite. But the actual facts / evidence is not so good at all. In this case, this story is a cautionary tale. But Jeb Bush is not at all interested in things as they are, in real life. So the myth continues and is even amplified, written in stone, told over and over. The failed school in ruins becomes a golden success story that transforms education, that bolsters his credentials, that provides hope. All fantasy. And unnecessary, counterproductive. To me, this is the same dance that we see with Shasta / Kennett and with traditional Zen and with many religious institutions. There is the great myth / narrative / story that is wonderful and filled with living Buddhas and awakened masters, unbroken lineage, enlightened tradition, skillful teachings, and so on.... and then there is the reality on the ground, the actual facts and history, the behavior, the fabricated and broken lineage, the half-baked masters, the willful blindness, toxic leaders and organizations, and so on. There is the ideal Kennett story and then there is the reality that can only be seen when you take the time to truly notice what actually happened, behavior, affects on others, when you allow yourself to see and tell the truth, share your insights, not be blinded by the imaginary light. I am not saying there is no light, just a 60-watt bulb is not the sun. When we get seduced by a big story, it is common human nature to hold on to that narrative at all costs - no matter what the facts. Reality be [banned term]. The story is so much brighter and simpler and wonderful. Reality is messy and complex and too human. We want to be students of fully enlightened divine beings - makes us more special - gives us this unique meaning and stature. We want the charter school to be a stellar example of education, even if it sits in ruins with no students or teachers. The false story supplants reality. But as we know, calling salt sweet does not make it so, and being caught in these kinds of myths have serious negative long-term consequences. The collection of stories you believe creates a kind of dense bubble of fog. You take refuge in the stories and live in the fog and tell yourself its a Buddha Field - not a very sane thing to do. You follow around a dog and pretend its a dragon. Nothing against dogs. Just know what's what. A puddle is not the ocean. What can't be thought? What isn't allowed to be spoken? In many cultic situations, there is a long list of things that are controlled - mind control, thought control, speech control. And if you say the unsayable, what happens? What are the consequences? There is one acceptable way to see and think, and everything else is some form of heresy, misconduct, breaking the precepts or rules, treason, call it what you will. So here is a good example, a blog post from the Daily Beast, written by my buddy Jay Michaelson- about how in Florida, the Governor has banned anyone in his administration from saying or writing the term "climate change" - so it doesn't exist, in Florida. According to an investigation by the nonprofit Florida Center for Investigative Reporting, an “unwritten policy” not to use the terms “climate change” or “global warming” took effect in 2011, after Governor Scott took office. Everyday we see more examples of the dangers of monolithic black and white thinking. This one is about teaching history in the schools in Oklahoma. To me "American exceptionalism" is quite similar to "Zen exceptionalism" same mind-set. As the story below says, "ignorance is bad for everybody." It may not be true that history is written by the victors, but in certain places, they’re making a hell of an effort to make sure it’s at least taught by them. 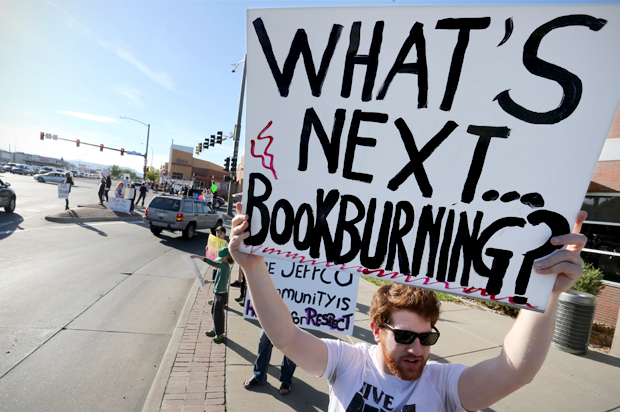 In Oklahoma this week, a legislative committee took aim at Advanced Placement U.S. History classes in public schools. Ignorance is bad for everybody. It only lowers the collective IQ when lawmakers still push to teach “intelligent design.” It similarly should never be a matter of any dispute that the Inquisition and the Crusades were bad ideas, and to take offense over pointing that out is inane. Likewise, these targeted, strategic attempts to force students – students who are intellectually sophisticated enough to take on college level coursework – to accept a propaganda-based curriculum is detrimental to critical thought as a whole. It should be absurd to promote any educational agenda that pushes jingoism as a lesson plan. It should never have gotten this far. And the reality of life in the 21st century is that we are sharing this planet with the rest of its inhabitants. It’s not just dumb and wrong to teach kids that we’re better than the rest of the world, and to attempt to conspicuously leave our past misdeeds from lessons — it’s bad diplomacy and it’s bad business. That’s not teaching exceptionalism; it’s teaching entitlement – not a useful quality on the global playing field. There’s a profound insecurity at the heart of any agenda that presumes that if kids aren’t spoon fed a black and white fairy tale of our national greatness, they’ll have no pride or loyalty. Arrogance isn’t patriotism, and education isn’t indoctrination. And anyone who doesn’t comprehend that difference doesn’t just need a history lesson, he needs a dictionary. and another example in the same vein....... about what's now going on in Venezuela... where devotion to a legacy can lead to paralysis. This is an example of a political or nation-state cult of personality, where Chavez is worshiped as this Christ-like figure, seen as perfect, flawless. He was also quite the bully-tyrant, not unlike many gurus. (I met Chavez in New York years ago). So Maduro lives out his guru's shadow - and to change anything, to think contrary thoughts - is unthinkable, feels like betrayal. Maduro received this "transmission" from Chavez - and the transmission is not mystical, but more psycho-social, dominating his mind, supplanting rational thought and reality. CARACAS, Venezuela — He thunders about conspiracies and assassination plots. He says that he sleeps with both eyes open. Few Venezuelans even know where he lives. Mr. Maduro came into office seeking to imitate his charismatic predecessor and mentor, Hugo Chávez, in nearly every way: the way he talked, the way he dressed and in his fulminations against American imperialism. But now, two years after the death of Mr. Chávez, with his country sinking deeper into an economic crisis, what was once Mr. Maduro’s greatest advantage — his absolute loyalty to the former leader — may have become his greatest handicap. “The government inaction, the inertia, comes from a belief that you find in Nicolás Maduro and his government about defending Chávez’s legacy, as if nothing that Chávez left can be touched, nothing can be changed or corrected because that would be considered a betrayal,” said Victor Álvarez, a leftist economist and former government minister under Mr. Chávez. Well before Mr. Chávez’s death on March 5, 2013, it became clear that many of his policies needed to be revised or even discarded to set the nation’s economy on the right track, Mr. Álvarez said. But wary of breaking from his mentor’s course, Mr. Maduro, who repeats Mr. Chávez’s name like a mantra and calls himself the son of Chávez, has doubled down on the same policies, which economists say have contributed to a storm of economic problems, including recession, soaring inflation and chronic shortages of basic goods. “Maduro has a tragic destiny,” said Alberto Barrera, a newspaper columnist and novelist. He argued that Mr. Maduro has to blame the United States and other enemies for the country’s problems because to do otherwise would recognize that Mr. Chávez’s legacy is flawed. “Maduro knows that he has to confront a very big crisis, but to accept and recognize the crisis is to recognize that Chávez and the revolution failed,” Mr. Barrera added. While Mr. Maduro sticks to Mr. Chávez’s legacy in economic matters — including price controls and government ownership of major companies that have stagnated and been mismanaged — many Venezuelans argue that he may have surpassed Mr. Chávez in one area: his attacks on the political opposition. After dispatching troops during protests last year, Mr. Maduro has jailed a succession of prominent politicians. Last month, the intelligence police raided the office of Antonio Ledezma, the mayor of Caracas, and hauled him off to jail. He has been accused of taking part in one of the many coup plots Mr. Maduro has alleged. Mr. Ledezma now sits in the Ramo Verde military prison, along with Leopoldo López, the leader of a political party who championed last year’s protests, and Daniel Ceballos, a former mayor. Another former opposition mayor, Enzo Scarano, was recently released. Mr. Chávez also sought regularly to intimidate the opposition, and he drove some opposing politicians into exile with threats to have them arrested. But opposition leaders say that being politically active is much riskier today. 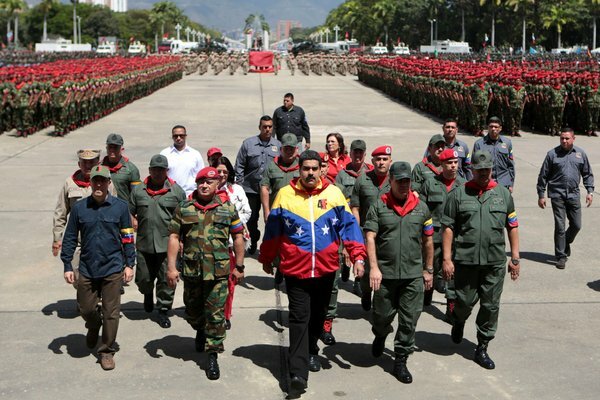 Mr. Maduro, a civilian with no military background, has loaded his government with military officers to a greater extent than Mr. Chávez, a former paratrooper who celebrated the trappings of military life. The ministers of finance, the interior and food and Mr. Maduro’s chief of staff are military officers, as are a number of other cabinet members. “The ministerial positions that manage the greatest economic resources are in the hands of military officers,” said Rocío San Miguel, president of Control Ciudadan o, a group that monitors the military. She said that more than a quarter of government ministers were now current or former military officers, compared with one in five near the end of Mr. Chávez’s presidency. Mr. Maduro has also lavished perks on the military, giving the armed forces their own television station, a bank and other prizes. 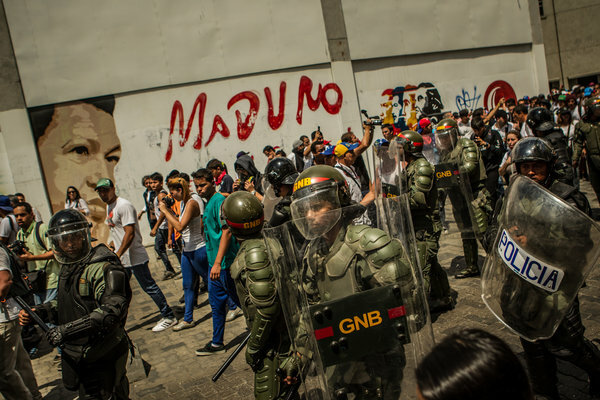 That has raised questions of whether Mr. Maduro has drawn the military close to build alliances, whether he is a captive of interests beyond his control, or both. Mr. Maduro was handpicked by Mr. Chávez, who was sick with cancer, to succeed him, and Mr. Maduro won a presidential election by a narrow margin in 2013. Yet to many he still seems stuck in Mr. Chávez’s shadow. Even his backers describe him in relation to his mentor. “He learned from Chávez to look at reality straight on and attack it as it is,” said Roy Daza, a member of Mr. Maduro’s United Socialist Party in the Latin American Parliament, a regional body. Critics say that attack typically focuses on the symptoms, not the roots, of longstanding problems. Faced with huge lines and shortages of basic items like corn flour or sugar, Mr. Maduro has jailed retail executives while steadfastly maintaining the price controls that many economists say cause the problem. “Instead of attacking the structural causes that create these problems, they are attacking the consequences,” Mr. Álvarez, the former minister under Mr. Chávez, said of Mr. Maduro’s government. Mr. Maduro has shown a talent for juggling internal pressures and factions within the movement left behind by Mr. Chávez, sidelining some rivals and accommodating others. He pushed Jorge Giordani, a close adviser to Mr. Chávez, out of government and then suppressed a mini-revolt by Mr. Giordani’s supporters in his party’s left wing. And he has marginalized Rafael Ramírez, the powerful former head of the government oil company, PDVSA, removing him from that post and other crucial positions before finally packing him off as ambassador to the United Nations. But Diosdado Cabello, the president of the National Assembly and a former military officer, is considered Mr. Maduro’s main rival for power and also the government figure with the greatest influence within the armed forces. All that has led to a kind of Kremlinology here, with observers speculating on who is behind government actions and whether Mr. Maduro is fully in control. Despite his tough talk, Mr. Maduro has also earned a reputation for Hamlet-like indecisiveness. He has spoken for over a year about raising gasoline prices, the world’s lowest, but has taken no action. A long-promised foreign exchange reform last month turned out to be a tweak. “He is an enigma for Venezuelans,” said Mr. Barrera, the columnist, pointing to the mystery around Mr. Maduro’s residence as a metaphor for his presidency. The official presidential mansion, known as La Casona, is still occupied by one of Mr. Chávez’s daughters, Rosa Virginia, and her husband, Vice President Jorge Arreaza. Mr. Maduro has said the house is for the use of the late president’s family, for their protection. A government official, who spoke on the condition that he not be identified, said that Mr. Maduro lives in a residence inside a Caracas military base, Fort Tiuna. Mr. Maduro spends many hours each week on television denouncing his enemies inside and outside the country, including opposition politicians and the United States, in the style of Mr. Chávez. Last month, he ordered the American Embassy to sharply cut its staff. On the air, he describes himself as the victim of international machinations. The evidence he offers is often colorful but far from convincing to many Venezuelans, including many supporters. He rarely appears in public without his wife, Cilia Flores, a former legislator whom he calls the First Combatant. Recently, Mr. Maduro has focused on President Obama, sometimes pretending to speak directly to him during his speeches. He often describes Mr. Obama as a decent man unaware of the sinister forces in his government intent on attacking Venezuela. But in a recent speech, Mr. Maduro sounded hurt that Mr. Obama had not returned the attention.